Do you miss seeing your neighbours from November to March? Entice them out on a sunny winter’s day with a hot chocolate social. Or be ambitious and throw a community winterfest. Many community league parks have permanent fire pits. Portable ones may be available for you to use, too. Ask your community league or NRC what’s available, and if you’ll need a fire permit. Fireworks are great fun in the dark. Before you set any off, you’ll need permission and a Fireworks Permit. Your NRC or F&E Liaison can help you obtain one. See the City’s fireworks safety tips to ensure you have a safe, fun event. Remember: You are responsible for cleaning up all debris left behind. You should do a sweep of the area again the next day in the light to make sure you’ve picked everything up. 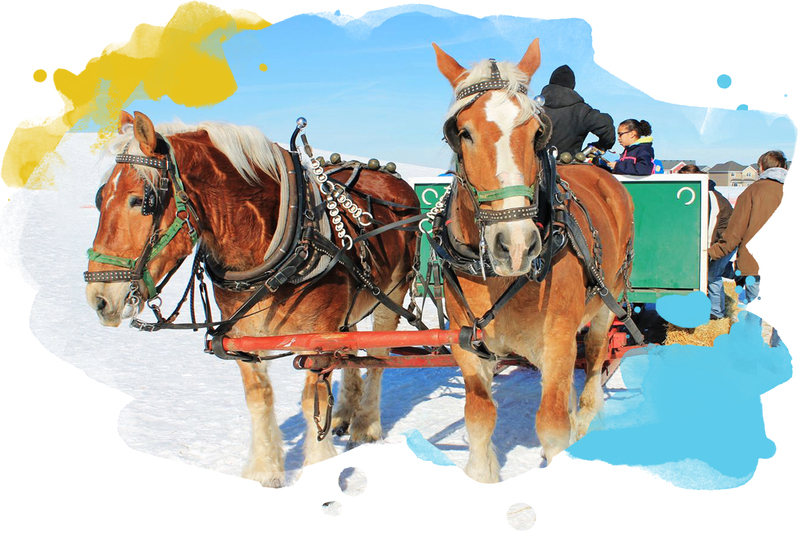 Permits will only be issued for approved sleigh ride vendors. When you plan your route, keep in mind that sleighs can travel along residential streets, and they can cross arterial roadways and bus routes but cannot travel on them. Events such as raffles and 50/50 draws require a charitable gaming licence from Alberta Gaming and Liquor and Commission. Licences can be obtained at any registry office.